Read enough birding trip reports on this or any other site and you’re sure to hear about peeps. Birders run into peeps all the time, so you can be sure the term does not refer to those sickly-sweet marshmallow chicks that only spring up around Easter. Nor is this term restricted to teens talking about their friends in chat rooms, as in “Yo, yo, yo, I’m kickin’ it with my peeps fo sheezy.” In the natural world, peeps are sandpipers, pure and simple. Actually, it’s not that simple. “Peeps” is the birding term used to describe several species of sandpiper of the genus Calidris that are near impossible to tell apart. These small shorebirds all have short legs and similar plumage and frequent mud flats in search of the same food. Traditionally, the five species of peeps in North America are the Baird’s, Least, Semipalmated, Western, and White-rumped sandpipers. Sometimes the Sanderling is added to the list. 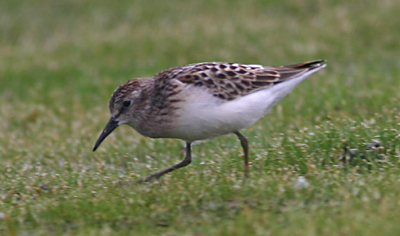 International birders include four Eurasian sandpipers, called stints, on the peeps roster. The Little Stint and Red-necked Stint are rare visitors to North American shores, while the Long-toed Stint and Temminck’s Stint don’t seem up for the trip. Most sandpipers shun cold weather, so in temperate climes, sandpiper migration can begin as early as July and run through early autumn. So run, don’t walk, to your nearest shore if you want to peep some peeps. I haven’t mastered “the peeps” yet, but at leat I don’t ignore them any more. I think there was just a Long-toed spotted on one of those Alaskan islands a few weeks ago. Temminck’s might be just around the corner! I have a definite love/hate relationship with peeps. Want to Buy The Birds of Europe by John Gould?